While drones as well as other kinds of flying toys have not really made positive news headlines all the time (no thanks to accidents and injuries, not to mention drones being used in cases of voyeurism), this does not mean that all flying toys should be banned. Here is the $59.95 Bubblecopter that will be able to inject some joy in the life of your little ones – and you do not have to wait until a special occasion to gift them something like this. 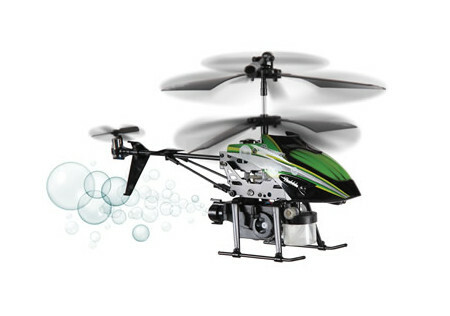 The Bubblecopter is a remote controlled helicopter that releases a steady stream of bubbles in its wake each time it flies. The helicopter’s reservoir will be able to carry up to 5ml of the included soap solution via its water droplet bottle, and it boasts of the ability to fly up, down, left, right, forward, and backward with precise stability that is granted by counter-rotating rotors. A 3.5-channel infrared remote trigger will let you control the Bubblecopter from a distance of up to 32′ away. Pressing the remote’s trigger will release the soap solution into the air so that bubbles are generated. A 50-minute charge delivers up to seven minutes of flight. As for the remote control itself, it will run on half a dozen batteries.